Before you get excited, this is not some spin-off of the popular RTG slot T-Rex. The Rex in question here is actually a police dog who is on the case to solve crimes and win you some big cash prizes in the process. I know, everybody loves a dinosaur but isn't a crime solving canine much better? 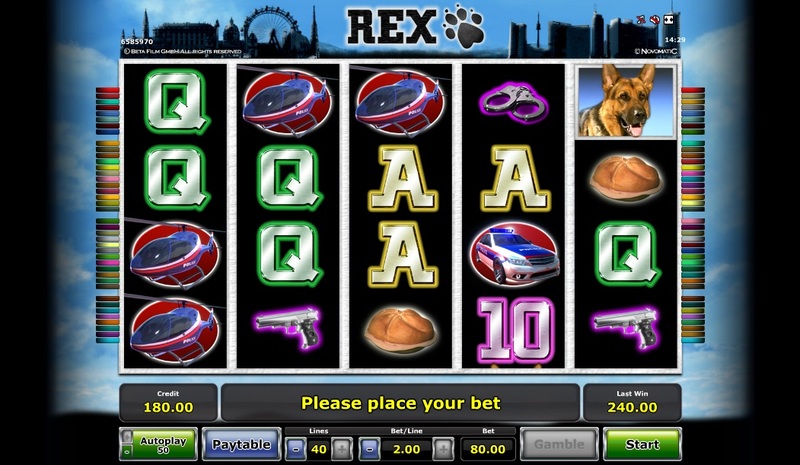 Rex is a 5-reel, 40-payline slot from Novomatic where the hero Rex is our headline symbol. Elsewhere, there is a police car, helicopter, gun, handcuffs, a sandwich, and your regular 9-through-to-Ace symbols. 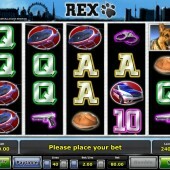 Basically, everything you would expect to see in a police dog-themed online slot! Rex himself acts as a Jackpot Bonus symbol. If you hit five Rex icons across the reels then you will trigger a payout that only amounts to 1,000 coins but this jackpot can be triggered quite frequently. The paw print is the game's Wild. It substitutes for all other symbols except the Scatters, to complete winning combinations. If you hit a number of Wilds across the reels then the payouts can be huge. The Scatters are represented by the blue police siren. If you hit three or more of these across the reels then you will win at least 16 free spins. During the free spins bonus round, the sandwich symbols will turn into Rex Jackpot Bonus symbols giving you more chance of completing winning combinations. Police-themed slots are very popular within the online slots industry. You only need to see Play'n Go's highly rated Cops 'n' Robbers slot or NetEnt's slick Crime Scene slot to understand how popular they are. Rex is another police-themed slot that brings the goods to the table and does not disappoint.